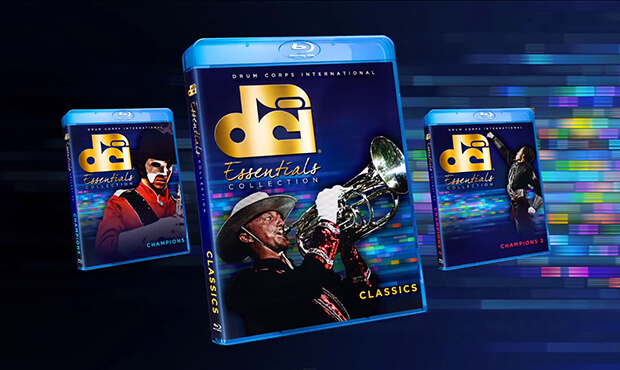 Drum Corps International introduces the newest addition to its historic audio/video collection—the Essentials Collection – Classics. Experience 13 legendary World Championship performances like never before with audio re-mastered in lossless 5.1 surround and video up-converted to high definition. The Essentials Collection utilizes cutting edge technology to create the highest quality audio and video possible from original source materials. The new Blu-ray disc is currently available from DCI's online store. Classics includes 13 performances from 13 different corps, spanning 34 years of Drum Corps International history. Included are a number of the most-remembered drum corps productions of all time, from the 1995 Madison Scouts' "A Drum Corps Fan's Dream" to Carolina Crown's 2007 horse-race-themed "Triple Crown." "The bulk of what we've done in re-mastering these performances relates to taking the source recordings and using today's technology to open them up and clarify them through the use of equalization and judicial use of compression," said Tom Blair who served as executive producer of all three volumes of the Essentials Collection. Priced at $59.95, the Essentials Collection – Classics is now available. The new Classics Blu-ray also is available bundled with the first two editions of the Essentials Collection. You can save nearly $50 by purchasing all three volumes together. Buy the Essentials Collection as a three-volume set.